Later this month 11 year old Cai James from Eglwyswrw in Pembrokeshire will be a guest at the Prostate Cymru Annual Ambassadors Lunch. Each year at the lunch fundraisers who support the charity throughout Wales are recognised and Cai has been nominated for the Prostate Cymru Young Fundraiser of the Year award having raised £1600 for the charity since 2018. 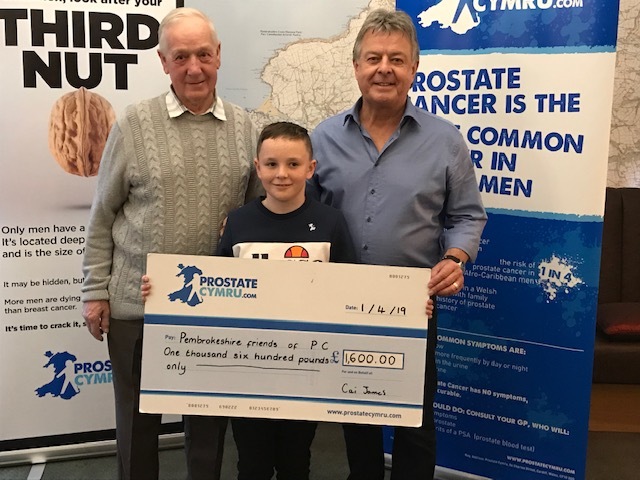 Cai, who is a pupil at Eglwyswrw Primary School, was inspired to raise money for Prostate Cymru in support of his grandfather Hayward Jones who is being treated for prostate cancer. Cai began his fundraising last year by making homemade Christmas decorations which he sold at the local Christmas Fayre. He also organised a raffle and held a Cawl a Chan at the Salutation Inn, Felindre Farchog who kindly donated the cawl in support. Prostate Cymru enjoys the support of many past and present Welsh rugby stars and Cai, who is passionate about rugby, is hoping to meet some of his idols who will be attending the lunch. Chairman of the Pembrokeshire Friends of Prostate Cymru Brian Harries recently met Cai and his family to accept the funds raised on behalf of the charity.